For over 35 years Musicworks magazine has been dedicated to the development of new and passionate audiences for experimental music. 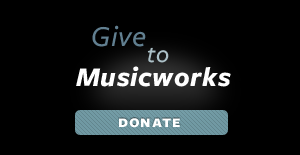 Promoting both emerging and established experimental musicians, Musicworks features composers, improvisers, instrument designers, and artists who work in genres such as radio, electroacoustics, concert music, sound installation, and sound sculpture. This tri-annual magazine, along with its curated CDs, dynamic website and outreach programs creates an inclusive community within which to exchange and develop ideas, and tantalize curious listeners with adventurous music. there is no better magazine covering the human interaction with sound. Musicworks is thrilled to be at the very forefront of the experimental music scene, actively building on our shared past and reinventing it for the future. Thanks for reading! Your support is a vital contribution to the future of experimental music, and ultimately, culture itself. We always want to hear from you; comment throughout the site, follow us on Twitter, and Facebook and sign up for our e-newsletter to stay in the know. Follow the links on the right to learn more about who we are, and where we're going. Please consider donating to our outreach programs. The Musicworks Society of Ontario is a small not-for-profit with a huge mandate. Read more about what we do to foster new audiences for experimental music, and how you can help. Musicworks' staff and board of directors.